We have recently expanded and updated our fabrication facilities (more), introduced state-of-the-art equipment (more), and redesigned a more efficient workflow. The location near downtown Memphis also houses a paint facility, office, field equipment maintenance shop and large storage yard. Our double open bay building is fully equipped with overhead cranes throughout the plant, material conveyors, beam drill line, hem saw, anglemaster, ironworkers, bandsaws, cut-off saws, forklifts, welding machines, mig welders, stud welding machines and plasma cutters. 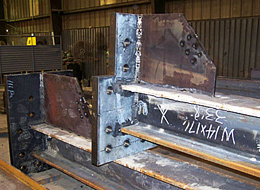 Utilizing these tools and the modern facility, our experienced fabrication team can provide excellent quality at a competitive price. Working under AISC guidelines, all welders are certified by the American Welding Society and place a strong emphasis on safe working environment and an accurate finished product. A QC checks all completed material for precision giving our customers the quality steel they expect from Tri-State Ironworks.